Whether this is the true site of Calvary is moot. The Church of the Holy Sepulchre has been recognized as the site of Jesus Christ's crucifixion since the early Byzantine period and today is one of Jerusalem's most visited tourist attractions and a place of deep religious significance. Within the basilica are the last stations of the Via Dolorosa - Jerusalem's famous pilgrimage walk. The Church of the Holy Sepulchre can seem surprisingly small compared with the great cathedrals of Italy, Spain, and France, but this modest size belies its deep significance. For Christian believers of all denominations, this is the most holy place of their faith. Walking through the crush of pilgrims and wafting incense within the church is one of the greatest experiences in Jerusalem's Old City. From the entrance, begin your sightseeing tour by taking the steps that lead down the north side to the Greek Orthodox Chapel of Adam in which there is also a cleft in the rock. The chapel gets its name from the legend that Adam's skull was found under the Cross at Christ's crucifixion. On either side of the entrance are stone benches marking the site of the tombs of the first two rulers of the Crusader kingdom, Godfrey of Bouillon and Baldwin I. Their remains were removed by Muslims in the 13th century, and the tombs themselves were broken up by fanatical Greek monks in 1808. The appearance of the tombs is known from drawings made before their destruction - low columns supported saddle roofs that bore Latin inscriptions. One of them read (according to Zev Vilnay): "Here lies the famous Duke Godfrey of Bouillon, who won this whole country for the Christian faith. May his soul rest in Christ. Amen." The other read: "Here lies King Baldwin, a second Judas Maccabeus, the hope of his country, the pride of the Church and its strength. Arabia and Egypt, Dan and overweening Damascus feared his power and humbly brought him gifts and tribute. Alas! This poor sarcophagus covers him." Heading west, you pass the Stone of Unction on which Christ's body was said to be laid and anointed after his crucifixion, and the Armenian-controlled Place of the Three Mary's where holy women watched the anointing. 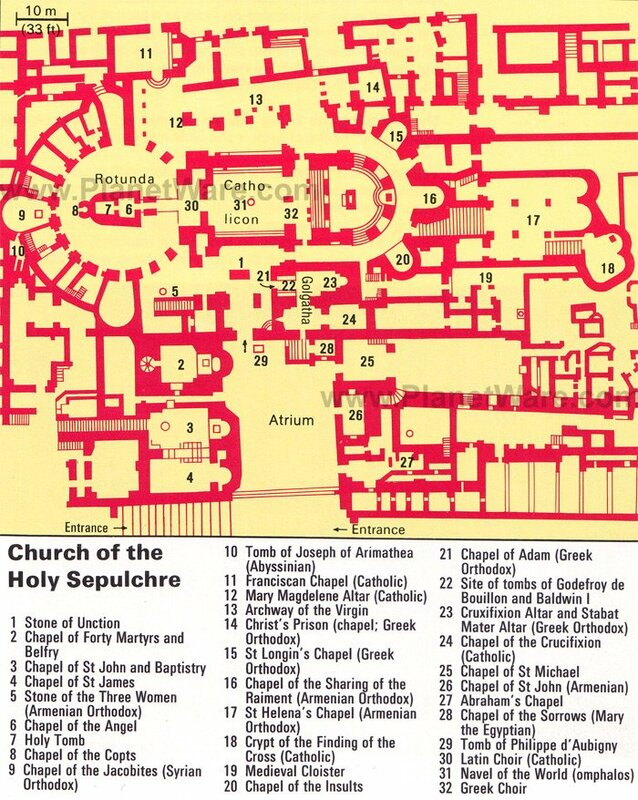 From here, you arrive at the Rotunda containing the Holy Sepulchre (Christ's tomb). The rotunda's exterior was rebuilt by a Smyrna Greek called Kalfa Komnenos after the 1808 fire and has a Turkish Rococo style. In front of the entrance are huge candelabra, and over the doorway hang 43 lamps (13 each belonging to the Greek, Latin, and Armenian churches, while four belong to the Copts). The structure of the tomb conceals the natural rock, which can only be seen in the Coptic Chapel to the rear of the Sepulchre. In an antechamber, the Angel's Chapel, is a stone on which the angel, who announced the resurrection of Christ to the holy women, is said to have sat. A low door leads into the small tomb chamber along the right-hand wall of which is a marble slab marking the empty burial place. Apart from the marble cladding, this is a tomb similar to many others dating from the time of Christ, closed by a round millstone whose diameter determined the height of the entrance. During the night before Easter Sunday, the Holy Sepulchre is the scene of a ceremony in which the Greek Orthodox Patriarch of Jerusalem enters the Angel's Chapel - closed since Good Friday - and lights the "holy fire," with the light from the darkness of the tomb symbolising the Resurrection. On the south, west, and north sides of the Rotunda are semicircular conches. In the west conch, opposite the Coptic Chapel, is a Chapel of the Syrian Christians (Jacobites). In here, on the left, is the entrance to a rock-cut tomb. It is traditionally ascribed to Joseph of Arimathea, who also provided the tomb for Christ. It is still in its original condition, without marble cladding. The northern part of the Rotunda belongs to the Latins. The major point of interest here is the Chapel of the Franciscans, whose friary is immediately adjoining, and the Altar of Mary Magdalene. In the northern aisle are a number of columns of different periods, including richly decorated Corinthian columns from the original 4th-century church. These are known as the Arches of the Virgin, because the risen Christ is said to have appeared to his mother here. At the east end of the aisle is a small square chamber known without any historical basis as the Prison of Christ. At the east end of the nave, a semicircular passage runs past the Chapel of Longinus and the Chapel of the Parting of the Raiment to a flight of steps leading down to St. Helena's Chapel. In the rock face on the right are small crosses incised by pilgrims of the Crusader period. The chapel is roughly square, with four short columns of the Byzantine period carrying the high arches of the roof structure. Through the dome, light falls from above into the large central square, giving the chapel its own special atmosphere, which is enhanced by the lamps, the decorative textiles, and the altar. To the right of the principal apse is a recess from which Helena is said to have watched the bringing to light of the Roman cistern in which the True Cross was found. The main entrance is from Christian Quarter Road. You can also enter the complex from the nearby Ethiopian Monastery. Dress modestly. You will not be allowed to enter if you are wearing shorts, singlets, or open-backed tops. The Church of the Holy Sepulchre can seem more like a circus than a church at certain times, when the crush of pilgrims and tourists is at its worst. Come early to try and beat the crowds. The Church of the Holy Sepulchre sits approximately equal distance between Jaffa Gate and Damascus Gate. From central Jerusalem, take Egged Bus No 20, which runs from the central bus station to Jaffa Gate.